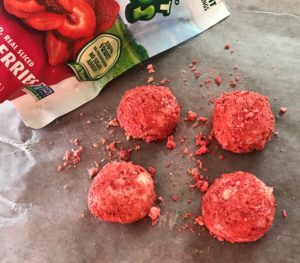 Our secret for the perfect pink coating is dusting these 3 ingredient strawberry truffles in freeze dried strawberry powder. The slight tartness of the powder balances out the sweet truffle filling in the most delicious way. 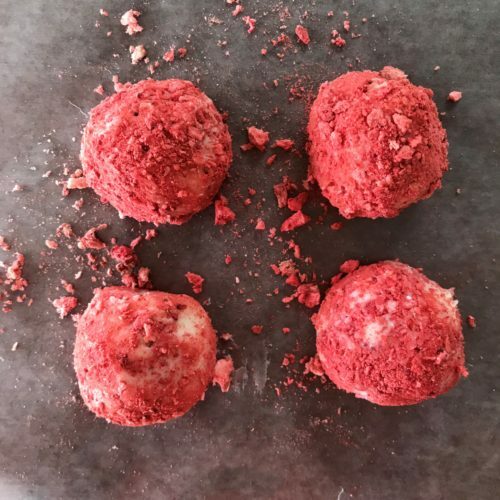 Easy 3 ingredient strawberry truffles made with freeze dried strawberries, white chocolate and Greek yogurt. A sweet Valentine's treat anyone will enjoy! Break the white chocolate into small pieces and place in a microwave safe bowl. Melt in the microwave for 25 seconds and stir. Keep doing this in 10-15 second intervals until the chocolate is almost melted. Remove from microwave and continue stirring until the chocolate is smooth. Add the 1/3 cup of yogurt to the melted chocolate and stir well. Place the bowl in the freezer for 2-5 hours until it's hard. Prepare the strawberry powder while mixture is cooling. Measure out 1 cup of freeze dried strawberries. Use a food processor or crush them with a glass until they turn into powder. Depending on your preference. you may keep some small strawberry pieces in the powder. Place the strawberry powder into a small bowl or dish which has enough room for rolling the chocolate mixture in. Prepare a baking sheet with wax paper before removing the chocolate mixture from the freezer. Use a spoon to scoop a cookie dough size amount out, and use your hands to roll into a ball. Roll each ball in the strawberry powder until coated and place on the baking sheet. Do this until all the chocolate mixture has been used. If your truffles are too soft, place in the freeze for another 15 - 20 minutes. Enjoy immediately or the truffles will start to melt. Superfruits you should be eating ALL year round!